This past Sunday, I attended with a couple of friends, an amazing and delicious event at the Vulture Festival. What is the Vulture Festival you ask? “Vulture is the go-to-site for everyone who lives, breathes, and consumes entertainment. Editors on both coasts survey America’s cultural landscape on the site, which offers around-the-clock, wall-to-wall coverage of movies, TV, music, and much more.” It was a 2-day event with screenings of upcoming shows, interviews, conversations, panels and Meet-and-Greet with stars. I attended a beautiful brunch in launching of the new TNT show, “CLAWS” premiering June 11th starring Niecy Nash. The whole cast appeared at the brunch and I was able to get a lovely picture with Niecy herself. All in all, I wasn’t going to pass up a fancy three course meal for only the price of $10! But nor was I going to show up unfashionably cued. Which is why I went on a brunch date in high style. I don’t know why I never thought of it before, but this cami is an actual slip beneath a silhouette blouse and this was the first time I decided to wear it as a standalone. If you have seen my post “Victorian Reign” (or if you haven’t click on the title) that was the blouse that had the tank top underneath. It is normally a two piece top. Well, I layered my cute silk-like top with a white blazer and paired it with one of my favorites pants. I styled these same trousers with a Tobi top in my earlier style post “My Love for Tobi”. Instead of wearing pumps, I opted for high wedges and used my chic satchel bag to compliment my look. 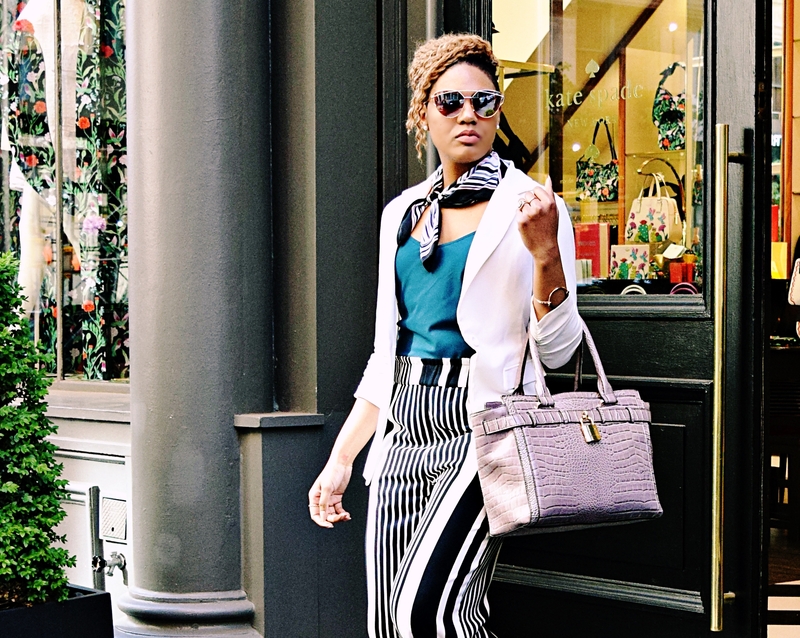 I wanted an overall chic and sophisticated look, so I tucked my cami in and instead of wearing a statement necklace (which would have been fine too), I threw on a striped scarf to match my trousers. It was comfortable and gave off a classy accent. Didn’t I say this was a brunch date in high style? I hope you liked my brunch look. Thank you for reading. Happy styling!